The camshaft is an apparatus often used in piston engines to operate poppet valves. It consists of a cylindrical rod running the length of the cylinder banks with a number of oblong lobes or cams protruding from it, one for each valve. The cams force the valves open by pressing on the valve, or on some intermediate mechanism, as they rotate. 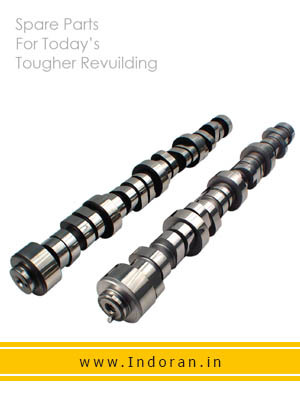 Camshafts are made up of cast iron, SG iron, chilled chrom cast iron, steel alloys, carbon steel, Usually nitridization is used on the camshafts to harden the surface.